Cattaneo Commercial have just completed the letting of 1 Brunswick Road, Kingston upon Thames KT2 6SB, a self-contained D1 surgery premises. 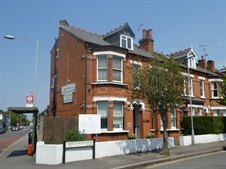 The property has ben taken by Heartsure Limited, a cardiac rehabilitation and prevention clinic. For further information, visit: www.heartsure.co.uk. If you are seeking commercial premises in or around the Kingston area, or if you have property you are considering letting or selling, please contact Andy Armiger on 020 8546 2166.